The ‘National Great Solidarity – Vietnam Cultural Heritage’ Week is scheduled to be held at the Culture-Tourism Village of Vietnamese Ethnic Groups in Dong Mo, Son Tay, Hanoi from November 18 to 24. Many traditional festivals will be re-enacted, including the Hoang Sa Soldier Feast and Commemoration Festival, the Bay Nui cow race festival and the Ok Om Bok festival. Additionally, workshops on preserving and promoting heritage and cultural values will also be held during the event. 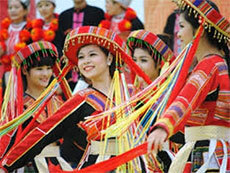 The week is organised by the Management Board of the Culture-Tourism Village of Vietnamese Ethnic Groups in collaboration with the Vietnam Fatherland Front Central Committee, the Departments of Culture, Sports and Tourism of provinces, cities such as Hanoi, Ha Giang, Lai Chau, Son La, Cao Bang and Can Tho, as well as the Museum of the Cultures of Vietnam’s Ethnic Groups and other relevant agencies. The Week of ‘National Great Solidarity – Vietnam Cultural Heritage’ is an important cultural event that aims to honor Vietnamese cultural identity.